A black comedy set in a small country village in Connemara, county Galway, Ireland, The Beauty Queen of Leenane depicts the decades-old struggle for power and independence between a 40-year-old spinster and her wry, devious, 70-year-old mother, for whom she acts as caregiver. This suspenseful, compelling and surprisingly funny drama builds with unrelenting tension towards an unforgettable and inevitable climax. 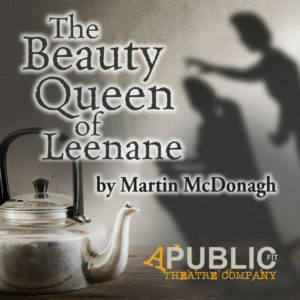 The Beauty Queen of Leenane features Darren Weller, Joan Mullaney, Mike Rasmussen and Mindy Woodhead and is directed by A Public Fit co-founder Ann Marie Pereth. As always, immediately following the performance A Public Fit will continue the conversation with The Buzzz, a moderated discussion of the play’s themes, style and impressions. The Buzzz is an expression of A Public Fit’s on-going commitment to audience engagement, treating each production as the start of an unending conversation.